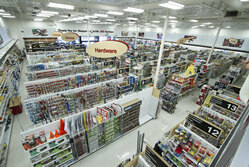 For more than 90 years, Ace Hardware has been America's neighborhood hardware retailer. Recognized as leader in the booming $358 billion home improvement industry, Ace Hardware is offering a tremendous opportunity for those wanting to build a profitable and lasting business. With the financial backing and support from a globally trusted and locally embraced brand you can start your own business that leads its industry in customer satisfaction. *Incentives vary by store format/size and are based on Discovery recommended products and quantities. Incentive given as a credit, not as cash or a loan. $330,000 is based on a recommended order for a 10,000sq. ft. store. "I look at Ace as a big family. We have dealer groups where you get to learn from other owners and share ideas. Since we have been in the dealer groups other owners have become close friends of mine that I can learn from. I still stay in contact with employees at the corporate offices that I worked with years ago." "Prior to owning an Ace I was working in corporate America and knew I didn't want to be behind a desk anymore. I looked at 30-40 different options of companies to invest in and the biggest reason I chose Ace is because they allow owners to be independent. I wanted a business I could learn and replicate and continue to do. I am proud to say in just four years I have two stores now and I'm working on opening my third." The ultimate success can be yours with Ace. Request information today to have an Ace representative contact you to answer any questions you have about this exciting opportunity! Speaker 1:When the hardware store in their home town closed. George and Lynn Havlicek saw an opportunity and seized it. Today they're the proud owner of Geneva Ace Hardware in west sunburn Chicago. George: We've been in the building business just shy of 30 years and I've been in a lot of lumber yards, a lot of hardware stores, so I think that was part of it. I had thought about it for a long time and I just always loved ACE hardware to, for some reason I've always gone to ACE more than any of them for some reason. Speaker 1:George and Lynn carefully evaluated the ACE ownership opportunity before deciding to invest. Then they looked to ACE for direction, support, and advice. George: Prior to doing this we went and visited a lot of stores with our district manager and got a lot of helpful advice from other owners and I would say that by the time we spent some time with them that we felt comfortable moving forward. Lynn: They were so helpful when we went to talk to them. There were woman who showed me pictures of their houseware or its department and how they set them up and they shared all kinds of information in what to do and not to do. That helped most, for quite a bit of display on it. Speaker 1:A multitude of decisions has to be made when opening a new store from choosing a location, to planning the décor, to selecting the product NIC. ACE offers valuable insights and expertise every step of the way. Lynn: They were really good in letting us try things and seeing how it went and then adding things that we wanted to see different colors, different ceilings, stuff like that, so that was good. George: What was nice is they know how much of a product you should carry your core initial stock order. We wouldn't have ever known how many nuts and bolts to have. Lynn: I thought they kept you on a very good time schedule too, because that's a concern you can take too long to build it out or too long to stock it or whatever, they keep you on schedule which is great. George: They've got it down; they know what they're doing. Speaker 1:As ACE retailers, George and Lynn were able to tailor their product mix to meet the needs of their customers. 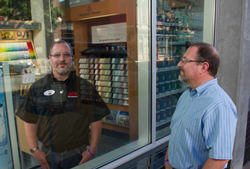 The store also reflects their own individual expertise and interest making it truly unique. George: The core of hardware and everything they pretty well got down know what you need to carry and they do allow you to specialize in bringing things that we wanted to. Being a designer and builder and Lynn owns the design the cabinetry company, so we put a full working kitchen in with appliances and our housewares we've been told second to none. Lynn: They were very corporative with that, they let us do that; they thought it was a great idea, so we could do cooking classes like some other ACEs do too. Then a chef in town can come in and do demonstrations. The school comes in and does demonstrations, so it just adds another aspect and they were great with that and encouraged it. Speaker 1:As they work to build their business George and Lynn continue to benefit from the ongoing support ACE provides. George: They don't go into it trying to guess at things, they have a lot of statistics and they know based on the size of the community and your store. They do a pretty good outline of what they believe the store is going to do and they don't over exaggerate or try to make it look better than it is. Lynn: We're lucky, it's a small town and it's a big deal that there's an ACE in the town, so it's a really lucky thing. George: We didn't want to go in and here and invent the hardware business, we went with someone that already had it down pretty down good. Speaker 1:It's their first year in business as any indication George and Lynn Havlicek have made the right decision by investing in ACE. 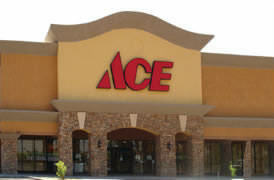 Ace Hardware is currently accepting inquiries from the following states: Wyoming, West Virginia, Wisconsin, Washington, Vermont, Virginia, Utah, Texas, Tennessee, South Dakota, South Carolina, Rhode Island, Pennsylvania, Oregon, Oklahoma, Ohio, New York, Nevada, New Mexico, New Jersey, New Hampshire, Nebraska, North Dakota, North Carolina, Montana, Mississippi, Missouri, Minnesota, Michigan, Maine, Maryland, Massachusetts, Louisiana, Kentucky, Kansas, Indiana, Illinois, Idaho, Iowa, Hawaii, Georgia, Florida, Delaware, Washington, D.C., Connecticut, Colorado, California, Arizona, Arkansas, Alabama, Alaska.